"A gluten-free salty sweet treat! These can be made with regular cereal as well." Place cereal in a large heatproof bowl. Melt butter in a saucepan over medium-high heat. Stir brown sugar, cream, and corn syrup into butter; cook, stirring, until mixture becomes thick and syrupy, 7 minutes. Stir 2 teaspoons salt into butter mixture. Remove from heat and add marshmallows; stir until marshmallows are smooth and melted. Pour marshmallow mixture over rice cereal and stir. Transfer cereal mixture to prepared baking dish and press down with greased parchment paper. Sprinkle with 1/2 teaspoon sea salt; cool and cut into squares. 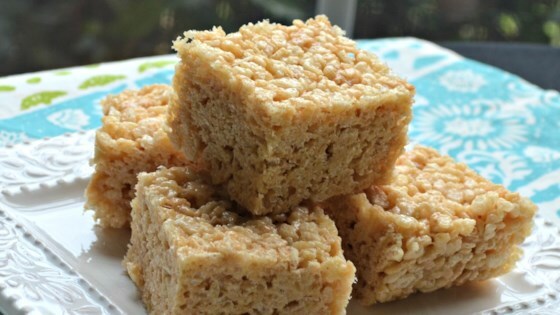 Delicious, gourmet, adult-friendly Rice Krispies® treats. I found these to be heavy and for the extra calories and ingredients just not worth it. I'll stick to the original. Almost too delicious! Only variation is I used a can of sweetened condensed milk that I cooked in crockpot first, for the caramel sauce. Then added marshmallows and Rice Krispies! I am a rice crispy lover, I don't know that I will be making them any other way! My family can't stop eating them! Worth (at the very least) trying once!